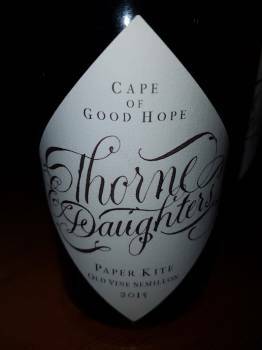 33% Roussanne, 23% Semillon, 18% Chenin Blanc, 20% Chardonnay and 6% Clairette sourced from various sites around the Western Cape. An unadulterated grape-like quality to the nose and palate. Also subtle notes of dried herbs, lime, lemon and stone fruit. Appears lighter and more delicate than the stellar 2014 but is unquestionably a seamless wine with real zip. So primary now, it should not be broached for at least 12 months. Semillon and Semillon Gris from both a Franschhoek and a Swartland vineyard. Skin fermented, maturation in older oak lasting nine months. Aromas and flavours of orange, yellow peach and red apple plus spice, earth and a little marzipan. Rich and broad with a savoury finish. Has a definite oxidative edge to it. Two tons of old-vine Semillon from Landau du Val in Franschhoek has resulted in 1 700 bottles of one of the most captivating modern SA white wines yet. Basket pressed, fermented and matured for nine months in older oak. Lemon, white peach, herbs and spice on the nose. The initial impression is one of startling fruit purity and a fantastic line of acidity but this is in fact a super-complex and quite haunting wine, revealing more nuance the more time you spend with it. Just about perfectly realised. Thorne & Daughters six-bottle mixed-case also available.